India’s election is largest democratic bi-parliamentary election in the world, Indonesia is the world’s biggest direct presidential election. If you thought that the only similarity between Indonesia and India is the first three and last two words of the country’s names, you would be surprised to know the similitude between the two countries. I am in Melbourne, Australia and on the morning of April 13, I watched the hugely long serpentine queue of expat Indonesians, waiting to cast their votes at the Indonesian Consulate. With an estimated 15,000 of 65,000 Indonesian eligible voters casting their ballots, they vote a few days before their country officially goes to the polls on April 17. As India finishes first of the seven phases of its election, Indonesia’s nearly 200 million voters would elect on a single day single phase of voting for electing the new President and also more than 20,000 national and local legislative seats across a country made up of around 18,000 islands. Many Indonesians in Australia are students and first-time voters in an election. Indonesia is also a ‘young country’ with more than 505 million of the population between 17-35 years of age. Like in India, Indonesian election is a democratic exercise which will determine Indonesia’s emerging future identity in the 21st century. 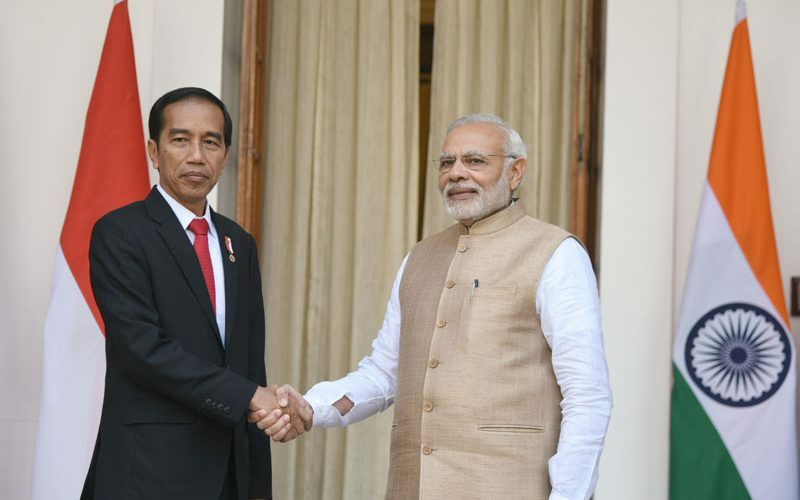 While India’s election is largest democratic bi-parliamentary election in the world, Indonesia is the world’s biggest direct presidential election. Discussing with my Indonesian friends in Melbourne, I realised some of the comparative analysis between Indian and Indonesian election. Though India’s population is six times that of Indonesia, the percent of population eligible of votes in Indonesia is same as in India -70 pc. India would take nearly one month in its 29 states, and election in Indonesia would be undertaken in just one day in its 18,000 islands. However, Indonesian expatriates all around the world would start voting a week before. 80 pc of Indonesians are Muslims where as 80 pc of Indians are Hindus. Interestingly, India hosts third largest Muslim population in the world, after Indonesia and Pakistan. While India has the largest Facebook users in the world, Indonesia has fourth largest users. WhatsApp users in India are half of that of Indonesia hence both countries are facing massive ‘fake news’ issues. Another striking comparison is that there are two main contenders in Indonesia, one is current President Joko Widodo who comes from humble beginnings (sounds familiar in Indian context? ), and is popularly known as Jokowi (compare it with NaMo)! Born in a village to a poor family, he started working in his father’s furniture workshop at the age of 12. Later he became mayor of his city and then started his political career. He was elected as the President in 2014, thus becoming the first President with poor background who started ruling the fourth largest country in the world. His rival in that election was Prabowo Subianto, former military general, traditional political elite, married to the daughter of former dictator General Suharto, who ruled Indonesia with an iron fist for 30 years. Subianto is again Jokowi’s rival in this current election. Most of the time after Suharto’s death, he was abroad. He made his political comeback in 2009. He has been trapped in allegation of human rights abuses committed under Gen Suharto. However, he denies all the allegations. The similarity between Indian and Indonesian election does not seem to end at this. In the 2014 presidential election Jokowi campaigned on a “man of the people” anti-corruption platform, promising to tackle poverty and to stamp out nepotism and intolerance. As a President, Jokowi over last four years has focused on infrastructure, introducing or restarting long-delayed programmes to build highways, high-speed rail. On foreign policy, Jokowi’s administration has placed an emphasis on “protecting Indonesia’s sovereignty”. After four years in office, Jokowi’s approval ratings remain high. Under his leadership the economy has grown steadily, the poverty rate is falling and some key infrastructure projects have been finalised – including a much-needed mass rapid transit network in the capital, Jakarta. As against this, presidential election Subianto campaigned on an anti-poverty platform, saying he wanted to reduce unemployment and create new jobs. His basis of campaign today remains the same. However, Jokowi has disappointed some supporters by abandoning campaign promises to resolve human rights violations. He has also been working to attract foreign investment from places like China, but his critics have accused him of not protecting national interest. His opponent has accused him of selling the country to foreigners. Conservative Islamic groups in Indonesia have grown during Jokowi’s tenure and there have been a string of high-profile blasphemy cases targeting religious minorities. My Indonesian friend opined, “While it is highly unlikely that the leader of the world’s largest Muslim nation can solve all the country’s issues in a single five-year term, we need a leader to tackle corruption and environmental mismanagement, as well as improve protections for minorities”. At the same time he feels nervous about the outcome, he has high hopes for his country’s future. Though he is Australia, he cares for his country. He hopes that Indonesia will grow and expand more rapidly and create a more effective government. Jokowi swept to power in 2014, the contest is much closer this time around. Let us see if the results of the election would also be worth comparing! On a concluding note, the Indonesian Ramayana is part of ‘Indosphere’ culture of South East Asia with a Muslim majority. Rama temples, newly discovered or old have never been major source of debates and violence.